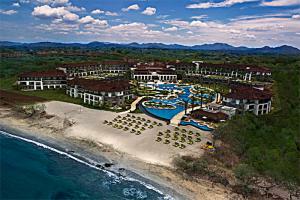 JW Marriott Guanacaste Resort & Spa offers the ultimate sumptuous vacation and a lifetime of memories. With 310 luxuriously appointed guest rooms, this beautiful resort is situated on a secluded beach in a prime location within Costa Rica's renowned central coast. 48 miles from the international airport in Liberia. Mansita Restaurant - International dining for breakfast, lunch, and dinner; Sabanero - Steakhouse; Azul Grill - Light lunches; Tamarine - Asian fusion cuisine. National Park Ricon de la Vieja.